Manali is the main point you have to reach. Then across Rohtang(3900mts) 49 kms from Manali, you reach Grampoo.Turn right from Grampoo, after crossing chattru and chotta dara, you reach Batal. Batal is around 100 kms from Manali.You can stay over night in Batal. You can drive to Chandertaal through a jeep road or trek 18 kms to reach Chandratal and it will take us about 5-6 hrs, while on this trek we will get a nice view of the Lahaul range, peaks like Minar(6172 M), Talagiri(6279 M), Tara Pahar(6227 M) and Mulkila (6517 M). At Chandertaal only tented accommodation is available. Next morning after breakfast we will trek to Tokpo Gongma(4350 mts/14300 ft.It is around 12 kms, and takes around 6hrs of walking. The trek is through rocks and scree.Enjoy a good view of the mountain peaks and glaciers throughout walk.there is a big river crossing to be done before reaching the campsite, so please do not go alone or if you don’t have technical skills.pitch your tents at tokpo gongma. It is advisable to leave the camp early the next morning. You have 2 rivers to cross today. There are a few snow bridges to be crossed. You can use a rope while crossing the river. The magnificent view of snow capped peaks stay with you until you get to the first major stream.the first stream is relatively easier . the water is icy cold. Then after 3 hrs , you will reach the bigger stream , this is the topko yongma, If you keep walking upstream, you will reach a snow covered area. Maybe you are lucky enough to find a snow bridge here.You have to camp at the grassy patch of tokpo yongma.Topko yongma is at an altitude of 4620 mts. The trek from topko gongma to topko yongma usually takes 5 to 6 hrs. The walk from topko yongma to Baralacha is a beautiful one . One stream has to be crossed. Then there are green plains which are vast, this place is called baralacha south. The landscape here is awesome. After a short walk you reach Baralacha station at Manali Leh highway. Baralacha La means the summit with cross roads from Spiti, Ladakh, Zanskar and Lahaul meet here. 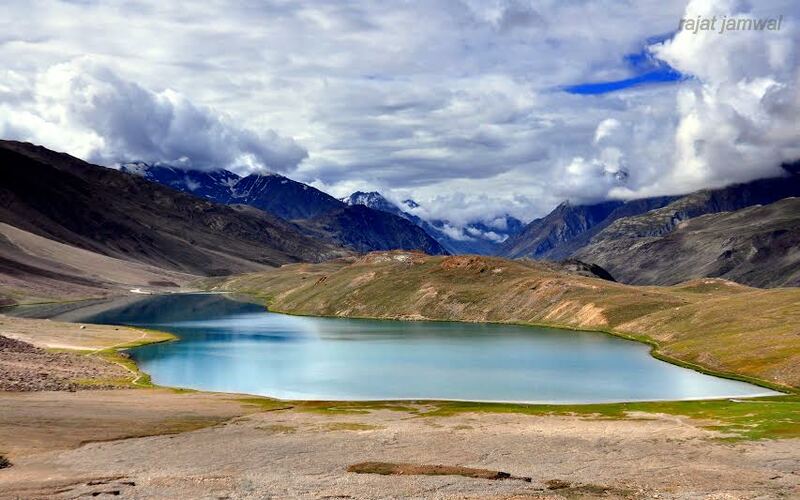 Near Baralacha La is the beautiful emerald lake, Suraj Taal, the source of the Bhaga River. Deo tibba base camp trek. Manali is where you have to arrive. Manali is 309 kms from Chandigarh, and 207 kms from Shimla. Arrive in Manali, and check in. Stroll around the town , for acclimatization. You start from Manali , and reach Jagatsukh, 6 kms from manali. You start the trek Upward from Jagatsukh, and after 4-5 kms of easy walk, you reach Khanol(2200 mts). This is an ideal place to camp. Next day, walk along the Jagatsukh stream, and though a forest of oak, pine and rhododendron , to reach Chikha(3000 mts). There is a lovely meadow here, and lots of sheep herds are here with their flocks. This place is ideal for camping. Next morning start early for Seri(3900 mts). To the deo tibba glacier, You can have a glimpse of Deo tibba from here. You can camp here or go back to Seri for the night, or return to Seri. Next day Seri to Chikha, and then Chikha to Jagatsukh, and then drive up to Manali.